Natural paradise 25 minutes to Casino Rama. Timber Frame, hot tub And Sauna. Hundreds of acres of walking trails through oak, maple and evergreen trees set on granite hills. Discover multiple canoeing lakes with an abundance of wild life. Bring your snowmobiles and explore the local groomed trails part of the Ontario network of snowmobile trails. Skiing is your hobby, experience the pristine hills of Mount Saint Louis Moonstone. Come in from playtime outdoors to a comforting fire, soothing sauna, hot tub and refreshing jacuzzi bath. Enjoy cooking in the fully stocked kitchen with double oven, island food prep area, Keurig coffee maker and expansive views. The 55 inch tv with unlimited wifi, two stereo systems in the great room with soaring windows offers a relaxing atmosphere that brings the beautiful outdoors into the warm space. The house is serviced by a sophisticated air filtration system ideal for allergy sufferers. The house provides central air conditioning and full laundry facilities. The Coldwater area boasts Geocaching, Big Chute Marine Railway, local museums, bowling, escape room and a variety of sumptuous restaurants, antique and gift shops. Coldwater is located 15 minutes from the City of Orillia with a full hospital, restaurants, (Tim Hortons) and plenty of shopping. Bring your friends and your pooch and enjoy. Maximum of 10 guests per booking. We love old movies, nature and discovering new things. We have three wonderful boys and enjoy careers in teaching and health care. We know the importance of family time and feel very blessed when our guests build memories in our homes. We do everything we can to provide a welcoming space. 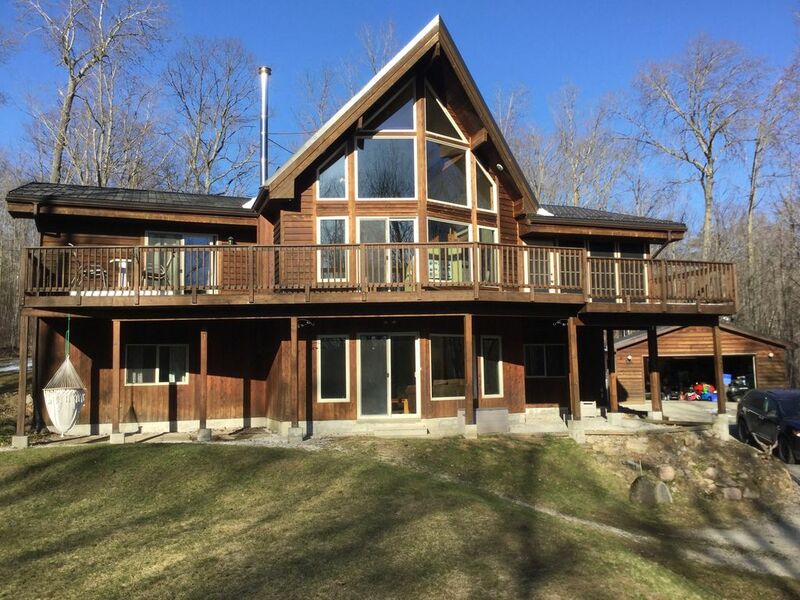 We enjoy Oak Ridge Retreat and its open concept with connection to the outddoors. The trails are wonderful and the easy access to Orillia and the Georgian Bay area offer endless things to do. The granite land scape and forest teaming with wildlife allows us to relax and forget about the city. After a day of discovery in the outdoors you we spend our evening playing many of the provided board games, soaking in the hot tub or relaxing in the sauna. toilet, combination tub/shower, shower, jetted tub, Vaulted ceiling and large jacuzzi tub of the master bedroom. toilet, shower, Large walk-in shower humidity controlled. toilet, Convenient powder room with ceramic and warm colours. Soaring 18 foot ceilings and window view. Fully stocked service for 12. Up stairs and downstairs stereo systems. We had a lovely time. The cottage was beautiful and the space worked well for our group, which was two couples and a baby. We enjoyed using the sauna and going for walks in the woods. We had a perfect time at this property. The location is ideal with a variety of trails, towns, and beaches to visit within a short distance. It is a very family friendly home stocked full of games and activities to do at the house. The kitchen was wonderful and had everything you would need to prepare a nice meal. Patricia was amazing as well. She responded quickly to questions and gave ideas on fun things to do. We can't say enough about how nice it was to stay at this property. We enjoyed our stay for sure! Pat was easy to get ahold of and everything was clean with extras available! We for sure want to all go again! The property was exactly as it appeared in the photos and very clean. It was a perfect retreat for a group. Pat was very prompt to respond to emails and helped us out with identifying some great hiking trails. I would definitely consider booking again. Fantastic host, home and property! Well equipped with kitchen and leisure supplies. Very comfortable home. We recommend guests do their research on activities in the area. There are thing so you do and see but all require driving some distances. Also, topographical maps would be handy to find your way along various trails and routes to bodies of water that we were unaware were there. The off-seasons could present activity issues if you have little ones. On our March Break visit there was no TV service to entertain them in the dark evenings. However the Internet was available.